The Lassen High School varsity boys’ basketball team played hard on the road while weaving through the trials of the Northern Section California Interscholastic Federation Division IV Playoffs. After finding themselves seeded five of 12, the Grizzlies fought with passion on the court for rounds one through three against Orland, Oroville and Gridley, respectively. In the first round, Lassen annihilated the Orland High School varsity team with a final score of 77-45 at home Feb. 21. Round two was held at Oroville High School as the Lassen Grizzlies took on the Oroville Tigers, seeded fourth, and again emerged victorious with a final score of 57-35 on Friday, Feb. 23. Unfortunately, on Wednesday, Feb. 28, the Grizzlies put an end to their playoff run with a 60-40 loss against the Gridley Bulldogs, seeded first, in the semifinal game. The second round of the playoffs was a guaranteed win for Lassen from the start. 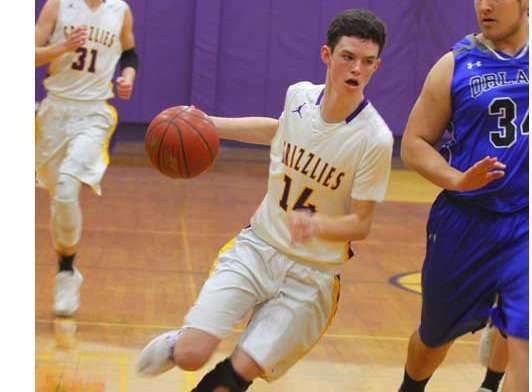 Though the Oroville Tigers were seeded above the Grizzlies, the purple and gold boys didn’t hesitate to step on the court with confidence and a raw hunger for victory. Lassen established the lead in quarter one with some strong offensive plays. By the end of the quarter, the Grizzlies had established a three-point lead with a score of 18-13 on the board. In quarter two, the Grizzlies shifted their focus to defense while still continuing to score. The Tigers managed a mere four-point gain throughout the entirety of the quarter due to the pressure and quick moves seen from the Grizzlies. Lassen, on the other hand, finished the first half with a total of 34 points to the team’s credit. Quarter three saw another dose of defensive power from the Grizzlies as Oroville only managed to add eight points to their score. Lassen gained 15 points during the third quarter. The fourth quarter was the only one in which the Tigers outscored the Grizzlies, but the 10-8 quarter four score wasn’t enough to steal away the lead from the Grizzlies. The final score of the game was 57-35, Lassen. Brand Satica led the Grizzlies against Oroville with 17 points on the board, nine of which were earned on the three-point arc. 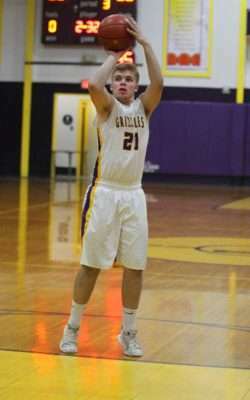 Bennett brought in 13 points for Lassen with one three-pointer and four free throws. Neil Growdon scored 12 points with one three-pointer and five free throws. Spencer Lively scored six points, Aaron Barnes four points, Kenton Ritz and Cole Dyer scored two points each and Will Ashmore hit one point to bring the Grizzlies to 57. With the win, Lassen continued to climb the bracket and thus took on the top-seeded team, the Gridley Bulldogs, Feb. 28. Again, Lassen stepped on the court with as much focus and determination as possible. Unfortunately for the purple and gold team, the power put forth by the Grizzlies wasn’t enough to get them out of the doghouse scratch-free. However, the stands were filled with loyal fans from both schools, thus adding to the overall spirit and atmosphere of the game. Lassen stumbled in the first quarter and ended it with a 19-9 score favoring the home team. The Grizzlies picked it up with speed, communication and precision during the second quarter. With that, Lassen outscored the Bulldogs 19-15, but Gridley was still in the lead by six points once halftime was called. The halftime break seemed to do wonders for the Bulldogs as the third quarter finished with Gridley in the lead 47-32. The Grizzlies then brought in eight points during quarter four to finish their tally at 40. Unfortunately for the purple and gold, Gridley responded with 13 points brought in during quarter four, and thus the final score of the game was 60-40 with the Bulldogs claiming victory. The varsity boys finished the section playoffs with an overall record of 21-8 and a county full of loyal fans cheering them on.